Explanation: SOHO, the space-based SOlar and Heliospheric Observatory, has become by far the reigning champion facility for discovering comets, its total having recently reached 200. 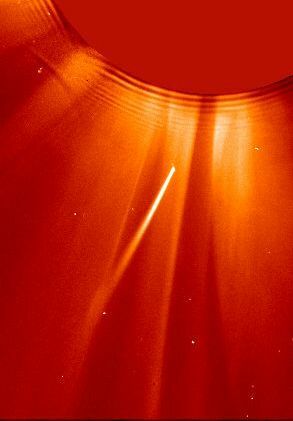 As might be expected of a solar observatory, most of the SOHO discovered comets are sungrazers, destined to dive within a mere 50 thousand kilometers or so of the solar photosphere. At that range the intense heat and gravitational forces make it unlikely these primitive chunks of ice and dust will survive. 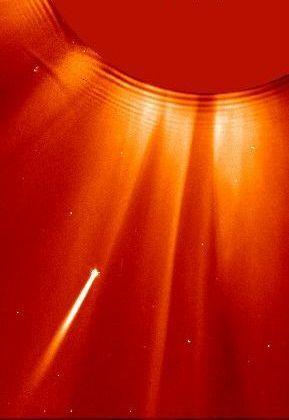 Based on their similar orbits, as first worked out by 19th century German astronomer Heinrich Kreutz, all sungrazers are believed to originate from a single large parent comet which broke up during a perihelion passage perhaps 2,000 years ago. Over time, pieces have continued to split off producing a family of smaller comets which seem to travel in the same orbit. These frames from SOHO's coronograph were taken two hours apart on April 29 of this year. They show a sungrazer (SOHO comet discovery number 111) with a long, bright tail headed toward its fiery encounter. The sun itself is hidden behind the coronograph's occulting disk at each frame's upper right.